Stenosis in the spine is a narrowing of the canal, or space, for the spinal cord or nerves traveling within the spine. The most frequent cause of stenosis is a combination of disc bulging and arthritis of the facet joints narrowing the spinal canal from both the front and back. Advancing age is a risk factor for both disc bulging and arthritis. Occasionally a cyst can originate from a facet joint and produce stenosis. Fatty tissue in the spinal column, called epidural lipomatosis, is another common cause of lumbar stenosis. Spondylolisthesis, or slippage of the bones of the spine, can lead to narrowing and stenosis as well. Stenosis in the neck is less common than lumbar stenosis but more serious. Pressure upon the spinal cord in the neck can lead to pain, weakness, or numbness in the arms or legs. Patients may have difficulty with fine motor skills such as hand-writing or buttoning a shirt. 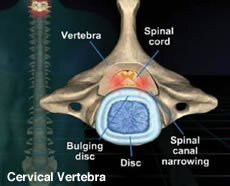 Cervical stenosis can also cause problems with balance and urinary incontinence and myelopathy. Stenosis is more common in the lumbar spine and typically presents as heaviness or pain in the legs with walking or standing. Sometimes patients cannot walk around the block or stand even five minutes because their legs give way. Occasionally patients have primarily back pain or deep hip pain with walking. After a thorough history and physical, a suspected diagnosis of stenosis can be confirmed by MRI. If a patient cannot get a MRI (for reasons such as having a pacemaker or spine stimulator) then a CAT scan myelogram can diagnose stenosis. Spinal stenosis does not typically respond well to medications or physical therapy although many times symptoms improve spontaneously without treatment. Epidural injections of steroid into the spinal canal can decrease inflammation of the nerves and frequently leads to symptom improvement. If the stenosis is severe, produces spinal cord compression in the neck, or fails to improve with injections, surgical intervention is recommended and typically quite effective. Lumbar laminectomy is the most common surgery in the low back. Anterior cervical discectomy is the most common surgery for the neck. 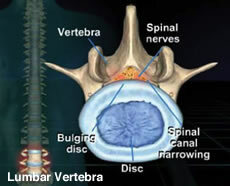 Dr. Button is very experienced in treating spinal stenosis. Please call 503-234-9861 to schedule a consult.